Site a temperature/humidity sensor where you want it, even if that location is not ideal for the transmitter, such as within an orchard's canopy. 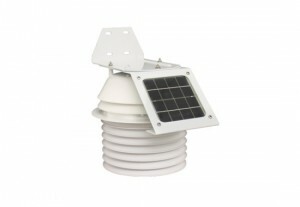 This sensor comes with a 7.6 meter cable which allows you to plug it into an Anemometer/Sensor Transmitter Kit or EnviroMonitor Node mounted separately from the sensor. Features both temperature and humidity sensors inside a 24-Hour Fan-Aspirated Radiation Shield. The fan constantly draws air in over the sensor giving you highly accurate temperature readings even during steep temperature changes such dusk or dawn. The shield protects the sensors from solar radiation and other sources of radiated and reflected heat. Perfect for installations where steep temperature gradients are common and where winds are low. If your installation does not have steep temperature gradients or low wind, consider the Temperature/Humidity Sensor with passive radiation shield (#6830).